Coyotes invariably shy away from humans. They have no interest in us. The closest I’ve seen a coyote come to a human is when one approached a person’s unleashed dog, either out of curiosity or for a short back-and-forth chase interaction. Coyotes are similar to dogs and have an interest in dogs, but it is best to keep our dogs and coyotes apart. Keeping our dogs leashed and next to ourselves is always the best insurance for keeping coyotes away. A leashed dog is calmer and less likely to pose either a visual or physical threat to a coyote, or be available for the chase-chase behavior. Also, with a dog leashed and next to you, if a coyote were to approach you, you would have only the coyote to think about, rather than having to think about how to grab your dog. You can shoo a coyote away by making loud noises, flailing your arms, and looking directly and defiantly at the coyote. The most obvious threat to a coyote is when an unleashed dog chases it. A dog might think this is fun, a game. But a coyote may not. A younger or beta coyote might just run off if chased — most do not want to confront a dog. But an alpha pack leader — these are the breeding females, the mothers — often will defend herself, often coming back after the dog that went after her. She may not only be defending herself physically, but also she may be defending the challenge to her alpha status. Several individuals have told me that a coyote has “played” with their dog. In 2005 we read about dogs playing with a lone coyote on Bernal Hill in San Francisco. Apparently the coyote chose only certain dogs to play with: they ran together and even wrestled. Everyone seems to be in agreement as to what was going on. I wasn’t there, but I read about it. On the other hand, someone else told me that their dog, too, has played with a coyote — this was in a totally different area where we know there was a mother and her offspring. The dog owner told me the coyote would weave in and out of hidden tunnels in the brush along a path, “teasing” his dog to get it to “play”. But this supposed “playing” occurred in March and April, which is pupping season — the dens are prepared and secured against danger and pups are born. Knowing what I do about where this “playing” took place — it is more likely about a female alpha coyote leading the dog away from an area she felt very protective of. A number of times I have seen short back-and-forth chases between an off-leash dog and a coyote, lasting only a few seconds, only with large dogs which the coyote knows. I’ve come to see that these are not “true chases” but rather a kind of bantering, or maybe taunting, with the intention by each that the other should “go”, “no, you go” — it is an interaction which is not really aggressive and is not meant to harm, even though the coyote has its hackles up and lips pulled back — it is more about messaging. Usually it is the coyote who ends up finally running off because the dog owner is close by. And usually it occurs when the dog and coyote happen upon each other by pure chance — maybe both were headed in the same direction at the same time at dusk, or each rounded a bend to find the other. In a similar vein, today I followed a coyote around a hill where, up ahead, it saw a lone, large dog with no one around. It was an area in which the coyote had been resting only ten minutes earlier. The dog’s yard is right by a park — the dog was actually in the park itself and not in the dog’s yard. Coyote pups were heard in the area last year, often at night, which may or may not be relevant. The coyote approached the dog with its hackles raised. The dog just stood there. So the coyote then bared its teeth: these are the coyote’s attendant behaviors in the “short back-and-forth chase” interaction — the intent is oneupmanship and messaging. This caused the dog to run off. The coyote then chased after it into its yard which was only a few feet away, and finally waited a few moments to be sure the dog had gone. I contacted the owner to hear her thoughts about this interaction — I’m trying to understand coyote behavior, so that we may all benefit. She also had seen the event. She told me that her large Afghan dog is a five-year-old female. She saw the Afghan run into the yard and then chase the coyote out. The owner’s opinion was that this “short back-and-forth chase” was a form of interaction verging on play and that it was done for the interaction, that it was totally harmless. There is no real “friendship” between the dog and the coyote, she said, but these two have interacted in the past, loping together in a nearby field, or engaging in this short back-and-forth chasing. 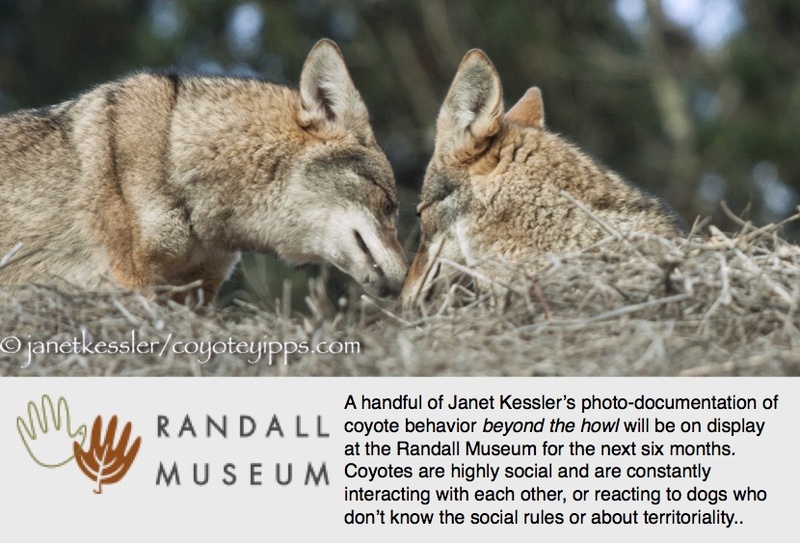 It was the owner’s opinion that coyotes sometimes get lonely and seek this kind of non-aggressive interaction akin to play which lasts only a minute, although it might appear to be more “serious” than it really is to someone seeing it for the first time. Letting one’s dog wander alone in a park where there are coyotes is probably not a good idea. This is especially so if your dog is small and very active. It is the small, hyperactive types of dogs which seem to provoke a stronger instinctual reactive response in coyotes. A human at the scene can prevent a coyote from approaching the dog in the first place. Please read postings on December 12th: “Dog Reactions to Seeing a Coyote”, November 4th:“Some Reactions to Dogs”, November 17th: “ANOTHER Reaction to Dogs”, and December 1: “Significance of a Seemingly Unprovoked Challenge”. “Blatant Visual Message for Newcomer Dog” on 2/8/10. “Coyote Safety” of 11/3/2009.